Cuvée Violette, as the name suggests, displays the perfumed and floral side of this noble grape variety. The palate is silky smooth thanks to a gentle co-ferment with just over 2.5% Viognier. The focus is on the feminine and graceful qualities of Syrah coming to the foreground. In the cellar we kid around and call this wine a syrah for Pinot Noir lovers. Crunchy bramble fruit and purple flowers mingle with pepper and spice. Red bramble fruits burst on the nose and on the palate. While 2016 is overall a structured vintage, this cuvee is ready to be enjoyed and savoured upon release. It can be aged for the mid-term (5-7 years). It will most likely continue to improve past that age too. Duck breast with pink peppercorn sauce. Steak Dianne with a flambe of crème de violette and cassis moutarde is a match made in heaven. Une syrah toute en finesse avec des tannins fermes et élégants et une acidité qui fait saliver. Et que dire de ses arômes enivrants de prune rouge, poivre blanc, violette et cassis. Un autre millésime très réussi!! Un partenaire idéal pour le gibier et les grillades. 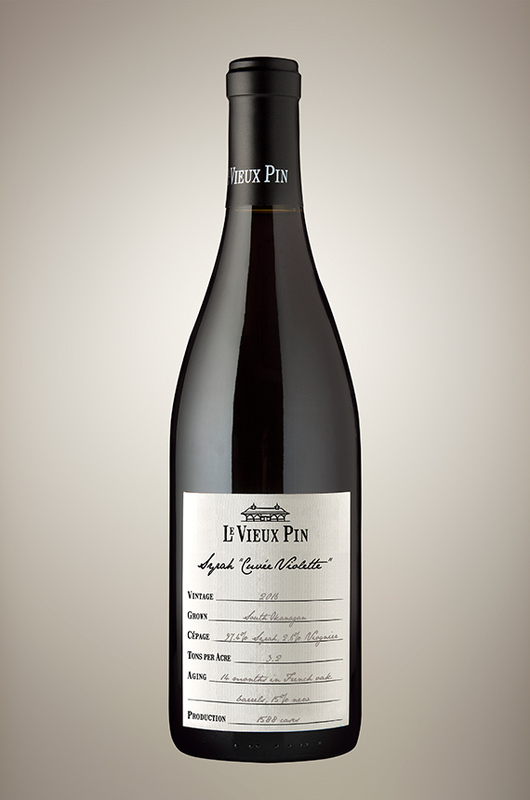 Open, and heavily violet – perfumed off the top, clean, and inviting, full of crunchy black fruit and pepper. The palate is fleshy and dense, with great length. Cuvee Violette is the least expensive, and less grand of Severine Pinte’s stellar syrahs, but there is an edge and vibrancy I really like. And make no mistake – the aromas and flavours are authentic and appealing northern Rhone. Expect lifted violet, black cherry/currant fruit, pepper, smoked meat, oak vanillin and spice. So complex and expansive on the palate – full bodied, dense and dripping with black fruit, licorice and pepper. Yet there is firmness and some tannin as well. The length is excellent. Best now to 2025.